*Please note that the following information was created prior to our project work on the ground in South Africa. To this extent, our resolution in working directly in Mtshini Wam informal settlement was not certain. Additionally, we were informed that our goal was to stay as open minded toward developments produced with the comunity as possible, leaving our research quite broad-scoped. There is currently a global crisis that leaves millions of people deprived of basic human rights. Citizens of world nations are left without clean water, safety services or tenure security. People under these situations take refuge in organic settings known as informal settlements. Informal settlements exist across the world, leaving millions to live in harsh conditions and a precarious legal setting. It is hard to define these population centres as they represent a wide variety of characteristics. Informal settlements are typically comprised of economically depressed or migrant people, living in crowded plots of land with or without legal rights to the land they live upon. While the cause of these situations differs with each community and region, they all present a series of severe challenges to their residents’ health, safety and future. Community members often have no choice but to settle in dangerous plots of land, use unsanitary water and worry about being evicted from their homes. Although informal settlements exist worldwide, they are particularly prevalent in South Africa. Apartheid, the South African system of segregation and racial policy created an environment that favoured white South Africans, leaving many coloured and black South Africans far from economic opportunity and preferential land. Due to changes in the law, full communities were displaced through racial divisions and were forced by the government to relocate to specific plots of lands away from city centres. In 1994, the Apartheid system was brought to an end, and in pursuit of job opportunities that cities offered, a migration of coloured and black South Africans began. These people settled on any land available including land unsuitable for human settlement and shacks formed of salvaged materials. The unplanned nature of these settlements led to a lack of formal services and the formation of informal settlements. With a new democracy in place and immigration of disadvantaged people to the cities, informal settlements were finally recognized as a critical state issue. Cities across South Africa began programmes of informal settlement eradication, relocation and housing subsidies. At this point there was no comprehensive approach for addressing the root causes of informal settlements. Instead the city’s plan represented an unsustainable attempt to minimize the symptoms of socioeconomic inequality. This approach was incapable of providing citizens their constitutionally guaranteed right to housing and services given the constraints of the new government. An example of an attempted “upgrading” strategy was initiated in the City of Cape Town through a top-down approach wherein the government implemented all developmental changes without mass community involvement. This type of informal settlement improvement methodology was first applied in the late 1990s in Marconi Beam, an informal settlement located within the city. The government’s strategy proved to be little more than a relocation process where the government failed to grasp the intricacies of the informal settlement’s community. The relocation process moved residents to the newly created formal settlement Joe Slovo Park, which quickly underwent the process of reinformalisation. In 2004, South African leaders attempted a new programme of informal settlement upgrading known as “Breaking New Ground” (BNG 2004). The N2 Gateway Project was the pilot project for this programme. The government worked on the creation of subsidy-driven housing for the betterment of the community (Baptist 2009). Although upgrading was the intent, in reality, this project met heavy opposition by the community, who began working closely with non-governmental organisations (NGOs) in order to attempt their own version of reblocking. The government lacked consideration for outside input in this process, particularly from the community and NGOs, leading to a large disconnect between the government’s intentions and the community’s needs. 2009 marked the Cape Town’s transition to Democratic Alliance leadership and a new strategy towards informal settlement upgrading, known as the five-year incremental plan. The programme was started to address the lack of low-income housing and the rapid urbanisation of the City of Cape Town by better utilising the Department of Human Settlements and its underlying branches (City plans for housing 2012). Though this new strategy was implemented, the actual approach to upgrading did not noticeably change from top-down to bottom-up until around 2010 (Fieuw 2012). This presented a paradigm shift in the way the country dealt with informal settlements. The City of Cape Town began a partnership with the NGOs, the Informal Settlement Network (ISN) and the Community Organisation Resource Centre (CORC), in order to establish a working relationship with informal settlement communities (Fieuw 2012). This relationship allowed the government, with the help of NGOs, to initiate a bottom-up strategy to better support the needs and wants of the communities. Through this partnership, 22 informal settlements were identified for upgrade in the new fashion of “reblocking”, including the settlement Joe Slovo Park (SDI 2012). “’Reblocking’ is a method to reorganise shacks (and the built environment) to create a better, safer urban environment, increase access and improve services” (Bradlow 2011). It is a method of reorganisation, not restarting, utilising the existing infrastructure in order to ensure community involvement and sustainability. 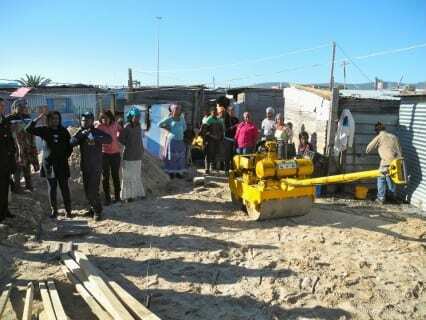 Joe Slovo Park, located in Milnerton, is a new project site for the WPI Cape Town Project Centre. The project will take place in a neighborhood of Joe Slovo Park called Mshini Wam, which is located inside the ring of government-subsidised houses from the formalisation of Marconi Beam. Since its creation in 2006, Mshini Wam has become home to 457 people in shacks created out of survival needs with little thought given to future growth of the settlement, causing inaccessibility and a lack of proper water and sanitation services. In 2006, a single fire destroyed 42 shacks before being contained demonstrating that roads to allow emergency vehicles through the settlements are needed (Fieuw 2012). Sanitation is a large issue for the community: houses in 2008 had only 1 tap per 150 households with no effective means to combat flood-water (Butana 2012). Short-term accommodations are often arranged in these communities by residents, many in Joe Slovo Park use illegal electric connections and were paying R30 – R50 a month to formal homeowners for access to water before taps were installed. The City of Cape Town in it’s partnerships with NGOs in community driven processes for informal settlement upgrade, has potential to be instructive and replicable on a national scale (Fieuw 2012). With a growing housing backlog of over 220,000, South Africa and the City of Cape Town have begun reaching out internationally for new innovative ways to close this gap between rights and reality (Robins 2002). The macro level of the government, in combination with the micro agencies of the community within Mshini Wam leads to gaps in communication and processes (Fieuw 2012). The NGOs involved are attempting to bridge these gaps but problems still persist. The main sponsor of the project, CORC, has been working in Mshini Wam providing funding and training to the community members while maintaining communications with the City of Cape Town. They have identified the project as supporting the current process in one of two ways: hard services provision in Mshini Wam or initiating another reblocking process in a nearby neighborhood. The purpose of each of these projects will be to support the collaboration between the various stakeholders keeping in mind the intricacies and tensions within the respective groups. The project’s mission in Cape Town will be to aid the upgrading of informal settlements through understanding the process in place, therefore being able to provide reasonable suggestions for process improvement. This project will integrate the methodologies of Shared Action Learning, a technique incorporating basic steps towards a solution while maintaining an open-mind to social and cultural dynamics. Through research and Shared Action Learning, amongst the team and the co-researchers, the project will be better equipped to offer varying solutions satisfying all perspectives. Whichever project is pursued, it is important to be mindful that the upgrading process is not simply moving a house; it is moving homes and relationships.